Ooma has been on our list since it opened its first branch in SM Mega Fashion Hall. But since we seldom go to SM Megamall nowadays, I knew this plan was not going to happen anytime soon. 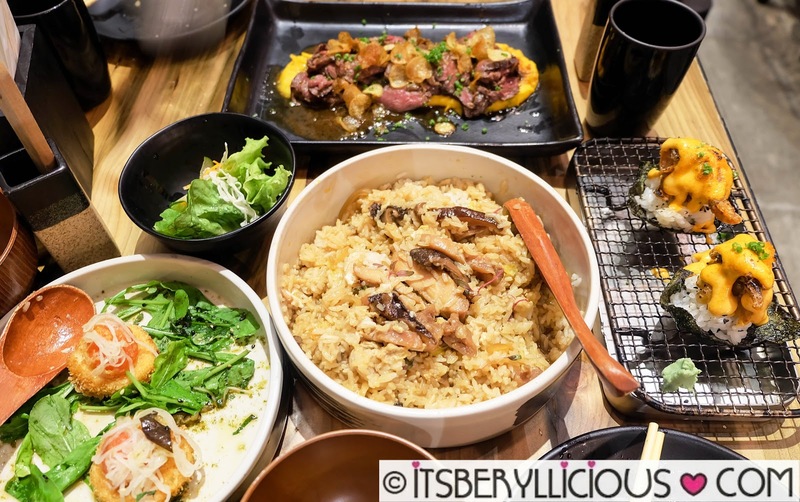 Fortunately, Ooma opened its second branch in Rockwell. Although we don't frequent Rockwell as much, it was timely that we will be dropping by Dessert Kitchen in Powerplant Mall. So, before we head out for dessert, we decided to eat at Ooma first. We arrived early for dinner, but we were already 4th on the waiting list. I noticed that the place was quite small and that tables were a bit cramped. I could almost touch the girl beside me if I extended my arm. We also decided to use bowls instead of plates to save some table space. We started with one of my favorite Japanese appetizer, Agedashi Tofu (P245). Ooma's version is a not-your-typical agedashi tofu in dashi sauce. 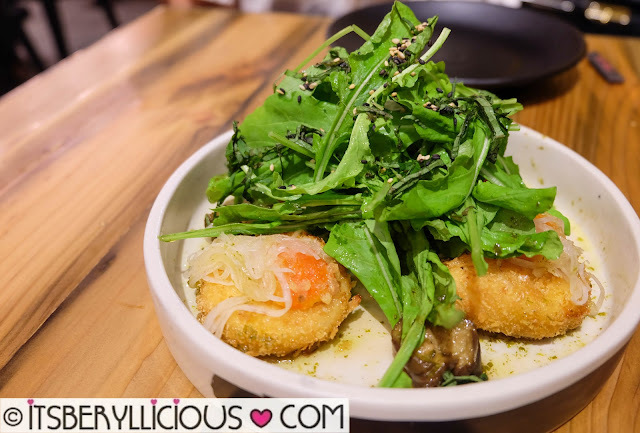 Instead, we got this deep fried breaded tofu with marinated eggplant, cherry tomatoes and field greens in a sweet and tangy dressing. Since we were ordering a rice bowl, we opted for Ooma's taco-maki instead of their maki rolls and aburi maki. 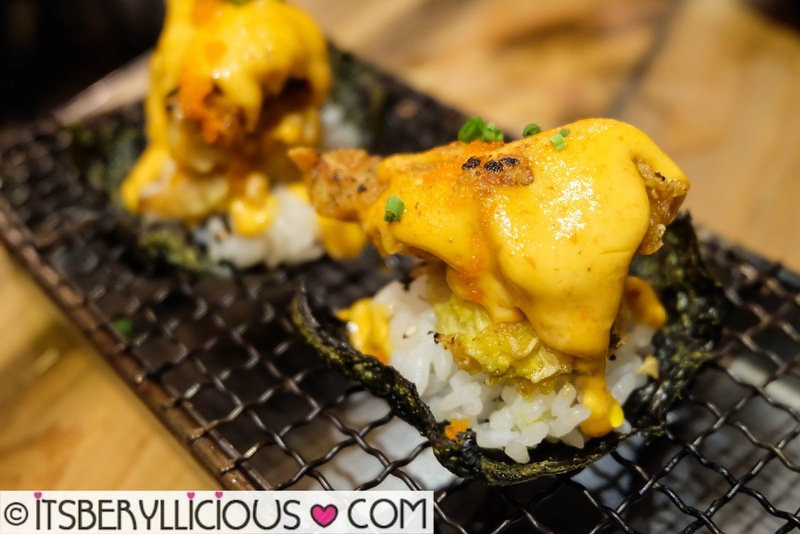 The Soft-Shell Crab Taco-Maki (P199) is a 2-pc. open-faced temaki, featuring a crispy soft shell crab topped with Ooma's signature aligue mayo. Yum! 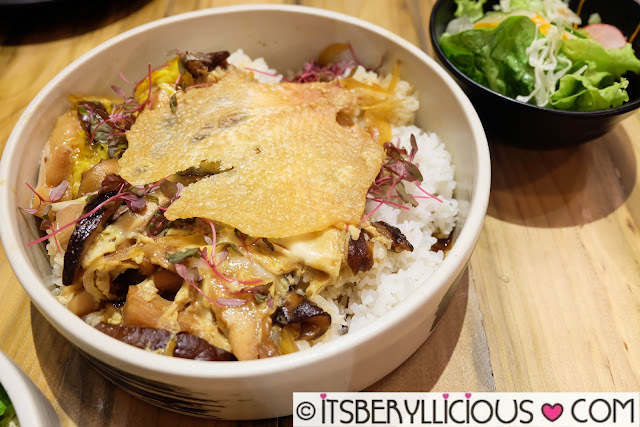 The Oyako Don (P289) was a bowl of smoked sous vide chicken, fresh mushrooms, onions, fresh egg, and crispy chicken skin, on top of steamed white rice. Serving size was really huge, an order could already be shared by 2-3 people. It was definitely worth every peso. I wanted to like the chicken skin, but it had this weird aftertaste. I don't know if that's normal, or the oil used was already old. Setting my eyes on both the Gyudon and Buta Kakuni Katsudon for my next visits. 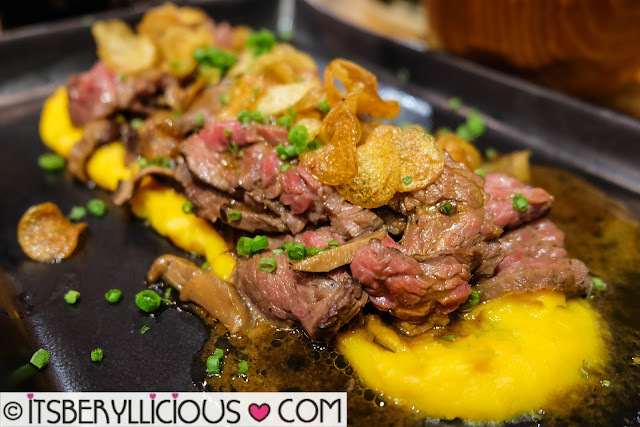 The highlight of our Ooma experience was this sous-vide tender Hanger Steak (P495) with sauteed mushrooms, white truffle oil, crispy baby potato, herb aioli and ponzu batter, in a bed of sweet potato mash. The steak was cooked perfectly. It was moist, tender, and heavenly with the hint of truffle and sweet potato mash complementing the slices of meat. We enjoyed everything we had at Ooma. 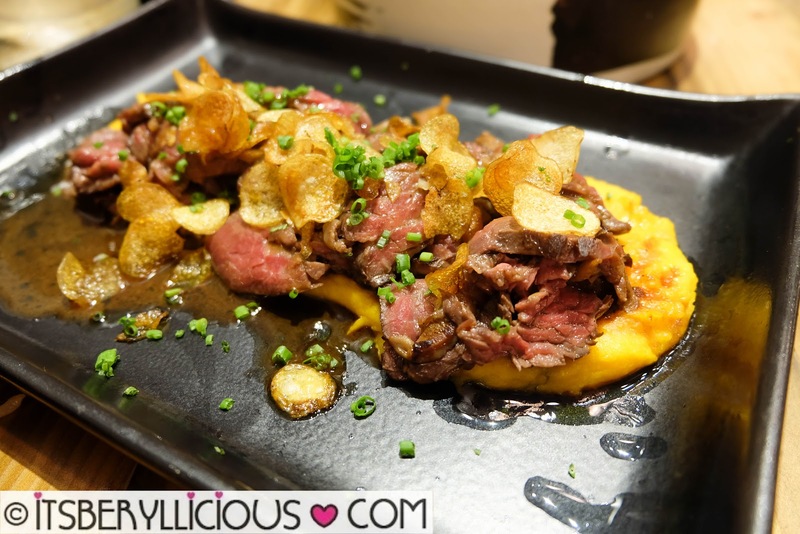 The whole experience left us impressed and at the same time excited to try more of Chef Bruce Ricketts creations. Prices were quite reasonable for the quality of food and service you'll get. Can't wait to go back!